custard | KBK Bakery's Adventures in Baking! I made this cake for my hubby’s work. They had two people having a birthday and his boss asked me if I would make something. It is, I must say a *very* healthy cake. I mean, how can you go wrong? 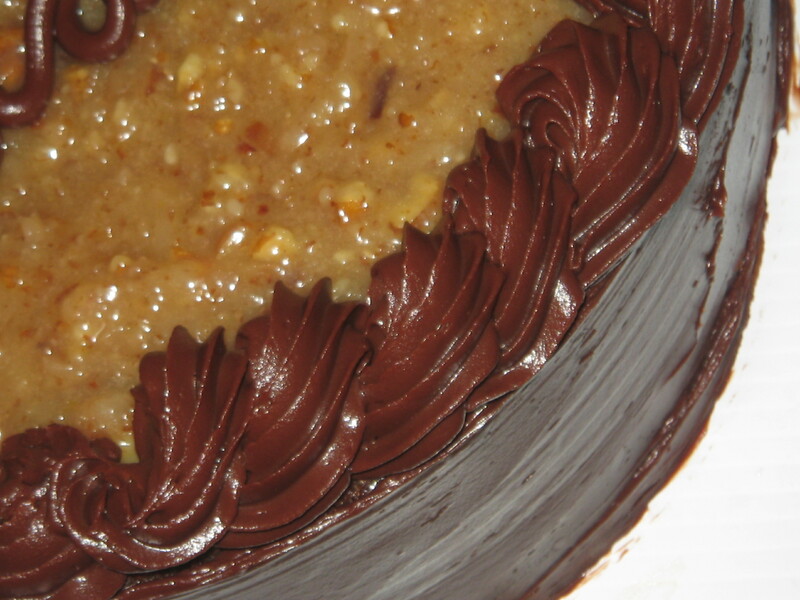 Rich chocolately cake… a custard based filling/icing… and a dark chocolate icing… very low fat. yup. not a heart attack on a platter or anything. And the real bummer is that I didn’t even get to try it. I’ve never made this recipe before and will all that wonderful butter and cream and eggs and coconut and pecans… sigh. Ah well, hubby said it was very rich, but he’s not a fan of sweets (and yet he married a baker… foolish man). I was worried that the super dark icing would overpower the rest of the cake but hubby thinks it helped to counter act some of the fillings sweetness. Guess I’ll have to make it again so I can judge for myself! 1. Place the 8 ounces of chopped chocolate in a bowl with the corn syrup and 1 ½ ounces of butter. Ice the sides with the chocolate icing, then pipe a decorative border of chocolate icing around the top, encircling the coconut topping.